It’s not easy to leave your comfort zone. I should know. Six months ago, my partner and I moved from our home in Texas to Tokyo, Japan. These past six months have been an incredible journey that I’ve been trying to put into words and as the twenty-something drafts in my Medium queue will attest to, am having difficulty doing. I should start from the beginning. Hi, I’m Chelsea. I’m a design researcher and UX designer. I’ve worked for five years in design, and three of those years were at the global strategy and design firm, frog. I love talking with people, understanding their needs, and advocating for others in building digital experiences. I also have traveled worldwide giving talks on playful design and design ethics. I’m also a reformed weeaboo. Weeaboo, for those of you who don’t know, is a derogatory term referring to someone who unabashedly loves anime, manga, and Japanese subculture. Weeaboos are generally seen as poorly adjusted folks who see Japan as a blameless utopia. At some point as an awkward teen all of these descriptors applied; nowadays, I’m enjoying more hobbies than just Japanese-related ones. As an adult, I only do my kira-kira dancing at home. It’s important for me to mention this because otherwise my life before design wouldn’t make much sense. Prior to entering the design field, I was a cartoonist who was bilingual in Japanese and English. I lived in Japan, and during that time, I published my first indie comic entirely in Japanese. I started learning Japanese superficially so that I could translate anime episodes, but kept learning Japanese because of Natsume Soseki, Ryu Murakami, and other contemporary authors whose words and literary themes I was dazzled by. When I lived in Japan, I saw the way language unlocked deep relationships with people who I would have never met otherwise. By the time I left Japan, I found myself split between two countries. I wanted to stay in Japan, but I wanted to go back to the United States. I ended up going back and staying for ten years. Until last year. Through interaction 17 in New York, an opportunity came to me to work in at Goodpatch, an international design agency and product company in Tokyo. They asked me to come work as a Senior UX Designer working on their rapid prototyping tool, Prott and to be a thought leader in the agency on Western markets and design research. This was when my life as a designer and my weeaboo life merged. My day-to-day work is in designing and mentoring. I speak about 70% in Japanese and 30% in English. I lead and run design research in Japanese and am a co-founder of the newly-established Hexagon UX, a Japanese-English bilingual group for women and non-binary folks in UX. 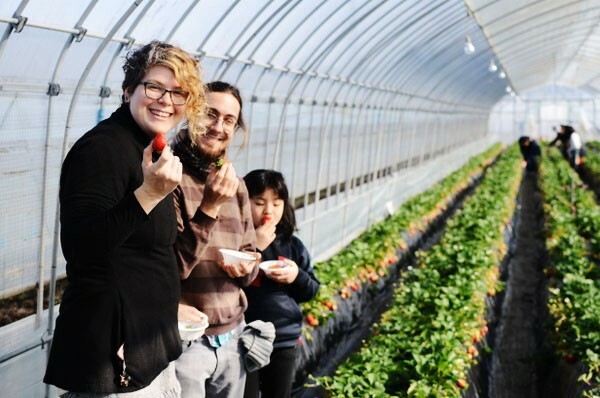 On the weekends, I’m building games, reading books, viewing cherry blossoms with friends and strawberry-picking with my host family in Tochigi. It can be challenging navigating the waters of American design thinking versus product design and implementation in Japan, but it’s extremely rewarding working in a multicultural and multilingual team. I’m learning new things every day. As an American designer talking about digital design in Japan, I initially started with judgments, that turned into questions. As a design researcher, I know that biases and assumptions affect the qualitative stories I collect from others. I should be asking questions first before I make judgments. 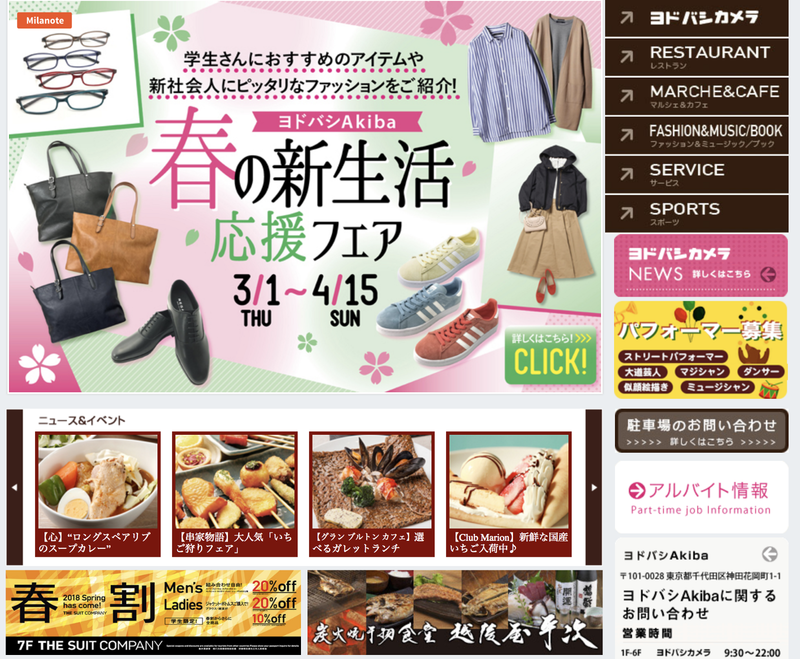 A typical example of Japanese big-box retailers’ websites. I’ve heard from others that it’s about this time in our careers that we start to have our expert blind spots. After five years of working in design, I have a still-growing mental resource in my head of what is effective and have far more confidence in the design process. This is great for pushing through ambiguous, difficult problems and finding the right areas to iterate more versus not reinventing the wheel. However, it can be limiting when taking risks and considering fresh perspectives to spark innovation. It’s easy to say, “no, that won’t work” or “this will absolutely work” without considering the fact that my past experiences are from a completely different context. Designing in this new context is far from comfortable, but the way it is challenging me is making me a better designer. It’s an exciting time to be in Tokyo. The field of UX is being defined by outspoken leaders and the community is supportive of one another. Most of us, like me, have taken a roundabout way to our design career and bring in fresh skills and viewpoints from their prior professions into design. Some of us are foreign, some of us are Japanese, but we’re all united by the passion we share for both human centered design and creation as a whole. I’m looking forward stepping out of our comfort zones together.